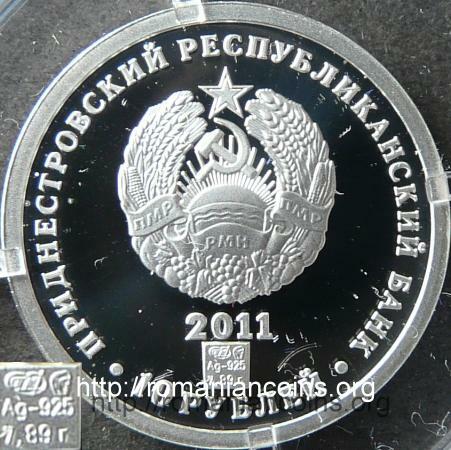 Obverse: denomination "10 RUBLEI" (Cyrillic), coat of arms of the self proclaimed republic of Transnistria (bearing hammer and sickle), inscription "• PRIDNESTROVSKII RESPUBLIKANSKII BANK •" (in Cyrillic and Russian) meaning "[TRANS] NISTRIAN REPUBLICAN BANK", year 2011, below the year a square with mintmarks (MMD and a Russian woman head), silver fineness, Ag-925 and 13.87 g, mass of the coin (Ag is written with Latin letters) Reverse: a death's-head hawk moth and a caterpillar on a twig, at right ensign between wings, inscription "sphingidae" with Latin letters representing the scientific name of the butterfly's family, inscription "KRASNAIA KNIGA PRIDNESTROVIIA" (in Cyrillic and Russian) meaning "RED BOOK OF [TRANS]NISTRIA"
Obverse: denomination "10 RUBLEI" (Cyrillic), coat of arms of the self proclaimed republic of Transnistria (bearing hammer and sickle), inscription "• PRIDNESTROVSKII RESPUBLIKANSKII BANK •" (in Cyrillic and Russian) meaning "[TRANS] NISTRIAN REPUBLICAN BANK", year 2011, below the year a square with mintmarks (MMD and a Russian woman head), silver fineness, Ag-925 and 7.89 g, mass of the coin (Ag is written with Latin letters) Reverse: a death's-head hawk moth and a caterpillar on a twig, at right ensign between wings, inscription "sphingidae" with Latin letters representing the scientific name of the butterfly's family, inscription "KRASNAIA KNIGA PRIDNESTROVIIA" (in Cyrillic and Russian) meaning "RED BOOK OF [TRANS]NISTRIA"
Death's-head hawk moth is a large moth, having a wingspan of 9-13 centimeters. Its name comes from the design on the torax, resembling a human skull seen from the front . 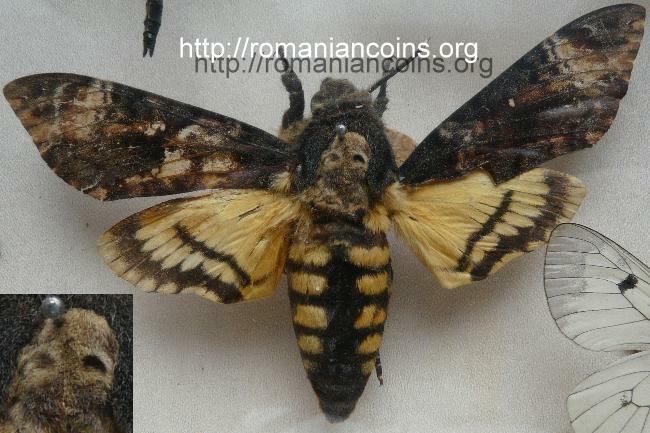 Simionescu shows  that this moth is also called by the people "strigă" [cries, in Romanian], most probably because, if taken in hand, it make a sound like a mouse squeak. The forewings are dark brown, with lighter spots. The hindwings and the abdomen are yellow, with black stripes. 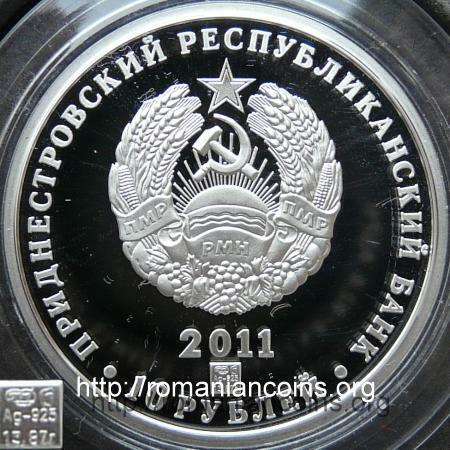 In Romania and the Republic of Moldova the moth on the coin is present in all areas, but however scarce. It feeds on sap, sometimes with honey from beehives. The caterpillar lives mainly on plants from Solanaceae family . On the coin the flower near to the larva's head seems to be one of Solanaceae. 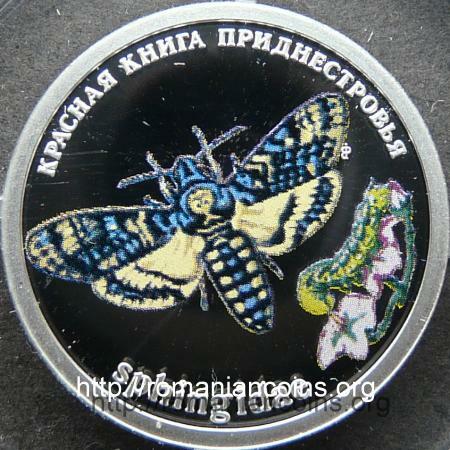 Many species from Sphingidae family are twilight moths. These moths are capable to hover near flowers, feeding with the long proboscis, that can be longer than the body. 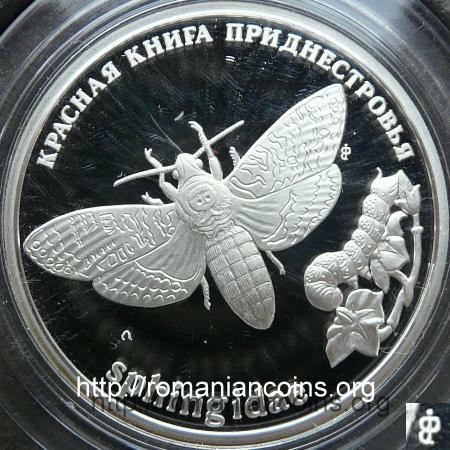 Ion Simionescu assures us that our people fear the death's head moth: "it is regarded as the messenger of death." The scientific name of the genus refers to the Acheron river in Tartarus, which the shadows of the ancient Greeks had to pass in order to reach the kingdom of Hades. The dead were to pay to ferryman Charon one obol (worn inside the mouth) for crossing the river, and were to give a cookie to the three-headed dog, Cerberus, that guarded the underworld. The species name refers to Atropos, one of the three Moirai, namely the one responsible for cutting the thread of life of the mortals. The family name - Sphingidae - comes from Sphinx - another dangerous creature (the caterpillars of the moths in this family take a defensive position like the Egyptian Sphinx - or at least so it seemed to the Swedish scientist Linné ). 1. Ionescu M.A., Entomologie. (Entomology) Editura de Stat Didactică şi Pedagogică, Bucureşti, 1962. 2. Messenger C., The Sphinx Moths (Lepidoptera: Sphingidae) of Nebraska. Transactions of the Nebraska Academy of Sciences, 24: 89-141, 1997. 3. Simionescu I., Fauna României. (Fauna of Romania) Ediţia a III-a. Editura Albatros, Bucureşti, 1983. 4. Stănoiu I., Bobîrnac B., Copăcescu S., Fluturi din România. (Butterflies from Romania) Editura Scrisul Românesc, Craiova, 1979.